Have you ever noticed how the simple things in life can bring so much happiness? Good friends, a warm fire, wonderful food? This falls into the last category, but would be excellent with the other two as well. I had two tasks at hand the night I made this. The first was to use a pound of frozen New Zealand lamb that was lurking suspiciously in the freezer. 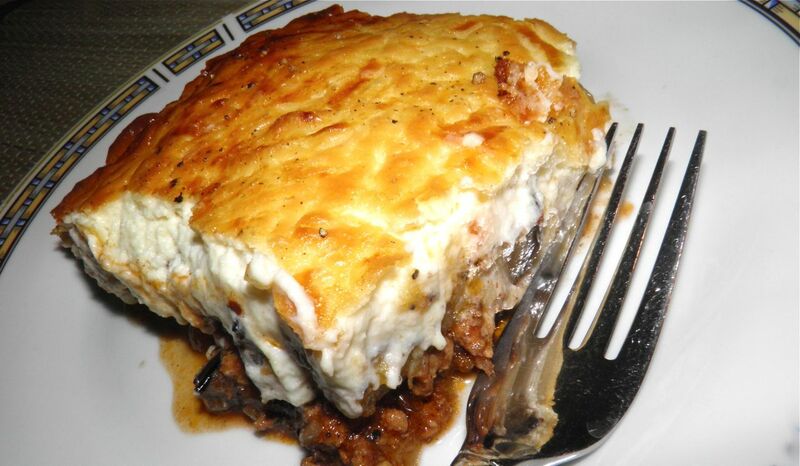 When lamb is at hand the best thing you can do is run for a Greek recipe. There’s nothing better that I can think of to make with it. The second task sprang from the first. I needed to find out how to make a ricotta béchamel. Why, you may ask. There’s two amazing Greek recipes lamb: pastitcio and moussaka. 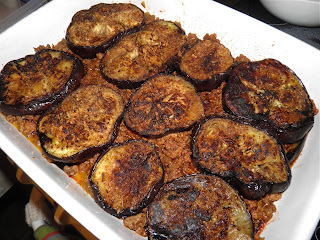 I love both and they’re very similar, the former using pasta and the second substituting eggplant. Both have a thick béchamel baked on top. I’ve taken quite a shine to eggplant lately. They’re an exotic looking beast that are very good for you. When prepared correctly they have a deep, smokey flavour. Mmmm. 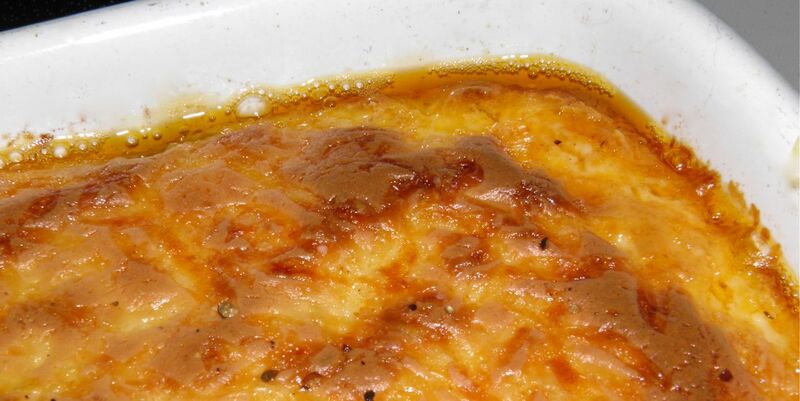 So moussaka it was. It was not a mistake. Both dishes benefit from being made ahead and reheated. They seem to “set up” better than when served piping hot. Luckily I had stuff to do (can you guess what...) so making something ahead was de rigueur. This recipe really isn’t a lot of work. I would say no more than making a lasagna, which is a close relative. 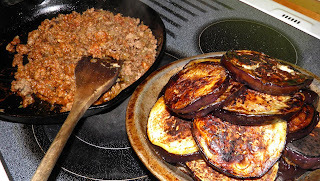 The secret, if there is one, is to pre-fry the eggplant slices until nicely browned. That’s what delivers that smokey flavour. 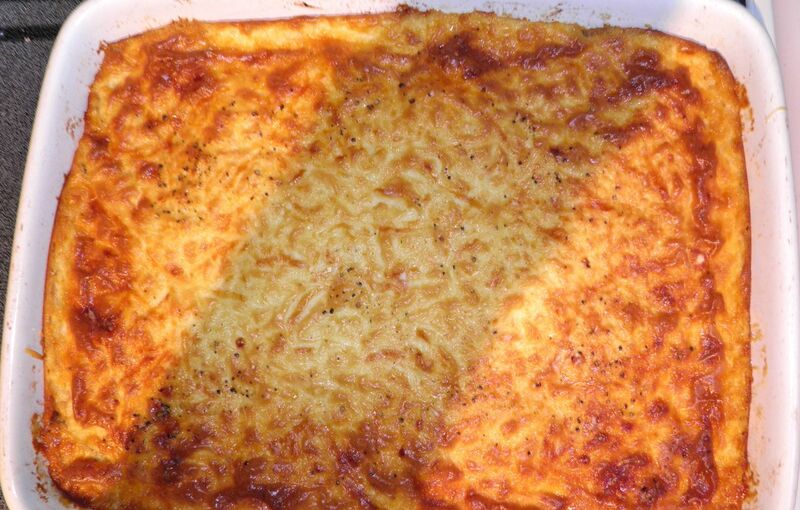 To prepare it you just make layers of eggplant and meat, top with the béchamel and stick it in the oven. Little more than an hour later you’re ready to serve six to eight people. With a Greek salad, definitely eight. Unfortunately, there’s only two of us. Guess what we’ll be taking for lunch? Slice the eggplant into 1/2” slices. You need enough slices to cover the bottom of a 10x14 pa twice. Heat a little olive oil in a skillet and cook the slices, a few at a time, until nicely browned. Sprinkle with salt as they cook. Remove to a pan. Cook the onion and garlic over medium heat until translucent. Then add the lamb and cook until no longer pink. Pour off any excess fat. Sprinkle the meat with the cinnamon, cloves, nutmeg, salt and pepper. Stir in 1/2 cup of the tomato sauce and set aside. Spread the remaining 1/2 cup of tomato sauce in the bottom of a 10x14 baking dish. Arrange half of the eggplant slices on the bottom. Then spread on the meat saice, and top with the remaining eggplant slices. 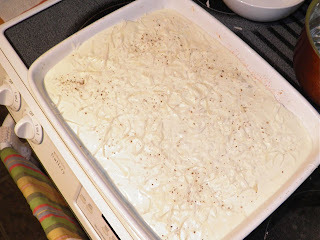 Preheat the oven to 350°F and make the béchamel. Melt the butter in a saucepan. Once melted, whisk in the flour and cook for 1 minute. Slowly add the milk and whisk until smooth. Remove from the heat. Stir in the ricotta, eggs, nutmeg and salt. Once smooth pour over the eggplant in the pan, making sure to cover the top completely. Sprinkle with the pepper and parmesan cheese. Bake for 1 hour 15 minutes until the top is nicely browned and the béchamel has set. Serve with a Greek salad. Try some chopped anchovies and hot banana peppers in the dressing for a delicious, unique taste.